If you're looking for a stylish and fresh new sedan that's packed with features and value, then you are likely considering affordable models like the 2019 Nissan Altima and its rival from Honda, the 2019 Accord. Both of these sedans were recently redesigned, with the Accord's coming for the 2018 model year and the Nissan Altima all-new for 2019. These two popular sedans may feature similar dimensions and engine performance specifications, but there are plenty of aspects that set them apart, too. At Performance Nissan, we're confident that Boca Raton and Fort Lauderdale, FL area drivers that shop and test drive the 2019 Altima and 2019 Accord will find that the all-new Nissan will suit their driving needs with its impressive standard features list and striking new design. Learn more about these two mid-size sedans below, then plan a visit to Performance Nissan for a closer look at our selection of new Nissan Altima sedans for sale in Pompano Beach, FL. When comparing the 2019 Nissan Altima S to the 2019 Accord LX, there are some striking differences in the features provided as standard equipment inside the cabins. As you approach the Altima S, you can utilize the Nissan's Intelligent Key proximity key system to unlock the doors with fumbling for your key fob, something that the Accord LX does not offer as standard. There's even convenient remote engine start on the Altima's key fob; if you drive the Accord base model, you'll have to wait until you enter the car to start it via the push button start system. With its standard 6-speaker audio system and voice-activated audio controls available through Siri Eyes Free, the 2019 Altima S delivers a powerful and seamless audio experience. Compare that to the Accord LX and its four speakers and you may find yourself wanting greater sound quality inside the Honda. When you're after driver comfort as well as cabin versatility, the 2019 Altima impresses with its array of generous standard seating features. The 2019 Altima S comes standard with an 8-way driver's seat with power adjustment for seat height, recline and tilt, whereas the Accord LX comes standard with only a 6-way manual adjustment seat. Both drivers and rear seat passengers will appreciate the standard 60/40 split-folding rear seat in the 2019 Altima that provides use of the back seat for both hauling passengers and cargo that extends from the spacious trunk. In the 2019 Accord LX, you'll find a one-piece rear seat that can either be folded down or up, but offers no configuration that will accommodate both cargo and passengers at the same time. The sales team at Performance Nissan welcomes nearby motorists from throughout the Pompano Beach area and beyond to visit us for a tour and test drive of the stylish and well-equipped 2019 Altima sedan. 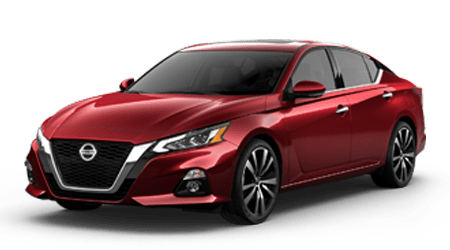 Let our sales specialists go over the many highlights of each distinct trim level of the all-new 2019 Altima, including the versions available with the innovative VC-Turbo engine or confidence-inspiring Intelligent All-Wheel Drive system that are both firsts for Nissan's popular mid-size sedan!